Think of any top international sport and you will be able to name several places around the world that have symbolic importance and that could be considered the sport’s home. Baseball has Wrigley Field, Fenway Park and Yankee Stadium. In football, there are iconic stadia such as Soldier Field, Foxboro and Lambeau Field, while soccer has dozens of famous and historic centers, spread all over the world, from Wembley Stadium in London to the Maracanã in Rio de Janeiro. However, in the world of boxing, there is only one center: Las Vegas. If you’re a fighter, a trainer, a promoter, a journalist or a fan of boxing, there is Vegas, and then there’s everywhere else. It hasn’t always been that way. For a long time, New York was the capital of the boxing world, and the place where television and the sport first became entwined. The first sports broadcast on US television was a featherweight bout between Willie Pep and Chalky Wright in 1944. When NBC launched its Friday night boxing show from Madison Square Garden, New York, the coverage became an enormous hit, with millions tuning in to watch a wide range of fights. By the 1950s, all three broadcast networks had got in on the act and boxing coverage reached saturation point. However, this had a negative long-term effect. To meet the public’s demand for entertaining fights, the quality of the bouts was sacrificed over the years. By the end of the 1950s, poor fights combined with fixing scandals had led to a steep decline in public interest, and by the time NBC ended its Friday night coverage, New York’s prominence in the boxing world was on the wane. At the same time, 2,500 miles away, a city in the Nevada desert was attempting to make a name for itself. Las Vegas had earned the distinction of being the first and at that time only location where casino gambling was legal, but the city was looking for other ways to draw in visitors and their dollars, and they found it in the sport of boxing. In 1955, the city hosted its first major fight, between light heavyweight Archie Moore and veteran Niño Valdés. The bout was heavily promoted, and Las Vegas casinos gave $100,000 to promoter Jack “Doc” Kearns to ensure its success. Only 6,000 people turned up to Cashman Field to watch that fight, but the seeds of Las Vegas’ boxing supremacy had been planted. Five years later, boxing moved indoors to the then brand-new Las Vegas Convention Center, and that’s when it really took off. The city produced several boxers who became nationally famous, and hosted significant championship fights such as the rematch between Sonny Liston and Floyd Patterson in 1963. Yet while the early days of Las Vegas boxing saw the city’s casinos work together, the money-making potential of boxing ensured that this couldn’t last. In that era, the casinos of Las Vegas represented the entirety of the US casino industry. These days, there are casinos in many states, and online gamers can access NJ online casinos free play promotions or visit a land-based casino in Atlantic City, Pennsylvania, Mississippi or a host of other locations. However, until the casino industry began to spread, with the legalization of casinos in Atlantic City in the late 1970s, Las Vegas was the casino industry, and these multibillion-dollar operations were not content to let the boxing profits be shared. The first big-money bout organized by a casino was the 1976 fight between George Foreman and Ron Lyle, promoted by Caesars Palace, which soon became the centerpiece of the boxing world. For the casinos, the attraction of boxing was obvious. Beyond the huge gate money and television revenue, major bouts brought in big-spending gamblers and thousands of visitors, producing an enormous boost to the casino’s takings. The heyday of casino-based venues, which also included several fights at the Las Vegas Hilton, the Mirage and other locations, came to an end in the 1990s, when the scale of the city demanded purpose-built arenas. 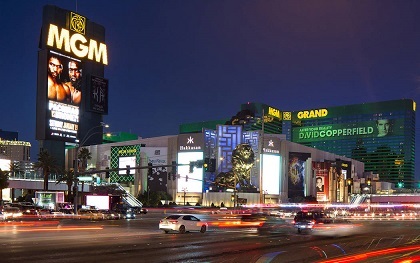 The MGM Grand, and latterly Mandalay Bay, were constructed to host the best boxing bouts, and a string of boxing stars including Evander Holyfield, Mike Tyson, Oscar De La Hoya and Floyd Mayweather helped to cement Vegas’ status as the world boxing capital. Today, boxing has faded from mainstream sports coverage in the US, but it remains a popular attraction in Las Vegas, and whenever a big fight is planned, Vegas is always the first and best option. When it comes to boxing, Vegas remains the only show in town. 0 Responses to "Las Vegas: a history of the world’s boxing home ground"